"Rio Grande del Norte" redirects here. For the Brazilian states, see Rio Grande do Norte and Rio Grande do Sul. 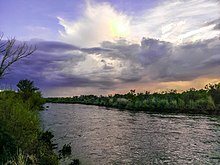 The Rio Grande (/ˈriːoʊ ˈɡrænd/ or /ˈriːoʊ ˈɡrɑːndeɪ/; Spanish: Río Bravo del Norte, Spanish pronunciation: [ˈri.o ˈβɾaβo ðel ˈnoɾte] ( listen) or simply Río Bravo) is one of the principal rivers (along with the Colorado River) in the southwest United States and northern Mexico. The Rio Grande begins in south-central Colorado in the United States and flows to the Gulf of Mexico. Along the way, it forms part of the Mexico–United States border. According to the International Boundary and Water Commission, its total length was 1,896 miles (3,051 km) in the late 1980s, though course shifts occasionally result in length changes. Depending on how it is measured, the Rio Grande is either the fourth- or fifth-longest river system in North America. 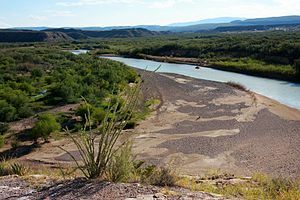 The river serves as part of the natural border between the U.S. state of Texas and the Mexican states of Chihuahua, Coahuila, Nuevo León, and Tamaulipas. 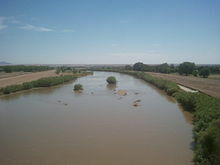 A very short stretch of the river serves as part of the boundary between the U.S. states of Texas and New Mexico. Since the mid–20th century, heavy water consumption by farms and cities along with many large diversion dams on the river has left only 20% of its natural discharge to flow to the Gulf. Near the river's mouth, the heavily irrigated lower Rio Grande Valley is an important agricultural region. The Rio Grande rises in the western part of the Rio Grande National Forest in the U.S. state of Colorado. 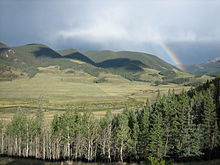 The river is formed by the joining of several streams at the base of Canby Mountain in the San Juan Mountains, just east of the Continental Divide. From there, it flows through the San Luis Valley, then south into the Middle Rio Grande Valley in New Mexico, passing through the Rio Grande Gorge near Taos, then toward Española, and picking up additional water from the San Juan-Chama Diversion Project from the Rio Chama. It then continues on a southerly route through the desert cities of Albuquerque and Las Cruces to El Paso, Texas, and Ciudad Juárez, Chihuahua. In the Albuquerque area, the river flows past a number of historic Pueblo villages, including Sandia Pueblo and Isleta Pueblo. Below El Paso, it serves as part of the border between the United States and Mexico. The official river border measurement ranges from 889 miles (1,431 km) to 1,248 miles (2,008 km), depending on how the river is measured. A major tributary, the Rio Conchos, enters at Ojinaga, Chihuahua, below El Paso, and supplies most of the water in the border segment. Other tributaries include the Pecos and the smaller Devils, which join the Rio Grande on the site of Amistad Dam. Despite its name and length, the Rio Grande is not navigable by ocean-going ships, nor do smaller passenger boats or cargo barges use it as a route. It is barely navigable at all, except by small boats in a few places; at its deepest point, the river's depth is 60 feet (18 m). The Rio Grande rises in high mountains and flows for much of its length at high elevation; Albuquerque is 5,312 feet (1,619 m), and El Paso 3,762 feet (1,147 m) above sea level. In New Mexico, the river flows through the Rio Grande rift from one sediment-filled basin to another, cutting canyons between the basins and supporting a fragile bosque ecosystem on its flood plain. From El Paso eastward, the river flows through desert. Although irrigated agriculture exists throughout most of its stretch, it is particularly extensive in the subtropical Lower Rio Grande Valley. The river ends in a small, sandy delta at the Gulf of Mexico. During portions of 2001 and 2002, the mouth of the Rio Grande was blocked by a sandbar. In the fall of 2003, the sandbar was cleared by high river flows around 7,063 cubic feet per second (200 m3/s). Navigation was active during much of the 19th century, with over 200 different steamboats operating between the river's mouth close to Brownsville and Rio Grande City, Texas. Many steamboats from the Ohio and Mississippi Rivers were requisitioned by the U.S. government and moved to the Rio Grande during the Mexican–American War in 1846. They provided transport for the U.S. Army, under General Zachary Taylor, to invade Monterrey, Nuevo León, via Camargo Municipality, Tamaulipas. Army engineers recommended that with small improvements, the river could easily be made navigable as far north as El Paso. Those recommendations were never acted upon. The Brownsville & Matamoros International Bridge, a large swing bridge, dates back to 1910 and is still in use today by automobiles connecting Brownsville with Matamoros, Tamaulipas. The swing mechanism has not been used since the early 1900s, though, when the last of the big steamboats disappeared. At one point, the bridge also had rail traffic. Railroad trains no longer use this bridge. A new rail bridge (West Rail International Crossing) connecting the U.S. and Mexico was built about 15 miles west of the Brownsville & Matamoros International Bridge. It was inaugurated in August 2015. It moved all rail operations out of downtown Brownsville and Matamoros. The West Rail International Crossing is the first new international rail crossing between the U.S. and Mexico in 105 years. The Brownsville & Matamoros International Bridge is now operated by the Brownsville and Matamoros Bridge Company, a joint venture between the Mexican government and the Union Pacific Railroad. At the mouth of the Rio Grande, on the Mexican side, was the large commercial port of Bagdad, Tamaulipas. During the American Civil War, this was the only legitimate port of the Confederacy. European warships anchored offshore to maintain the port's neutrality, and managed to do so successfully throughout that conflict, despite occasional stare-downs with blockading ships from the US Navy. It was a shallow-draft river port, with several smaller vessels that hauled cargo to and from the deeper-draft cargo ships anchored off shore. These deeper-draft ships could not cross the shallow sandbar at the mouth of the river. The port's commerce was European military supplies, in exchange for bales of cotton. US to Mexico over the Rio Grand river. During the late 1830s and early 1840s, the river marked the disputed border between Mexico and the nascent Republic of Texas; Mexico marked the border at the Nueces River. The disagreement provided part of the rationale for the US invasion of Mexico in 1846, after Texas had been admitted as a new state. 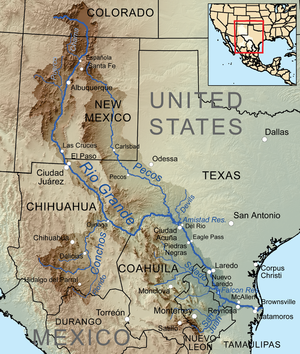 Since 1848, the Rio Grande has marked the boundary between Mexico and the United States from the twin cities of El Paso, Texas, and Ciudad Juárez, Chihuahua, to the Gulf of Mexico. As such, crossing the river was the escape route used by some Texan slaves to seek freedom. Mexico had liberal colonization policies and had abolished slavery in 1828. In 1899, after a gradual change to the river position, a channel was dug for flood control which moved the river, creating what was called Cordova Island, which became the center of the Chamizal dispute. Resolving the dispute took many years and almost resulted in a 1909 combined assassination attempt on the American and Mexican presidents. In mid-2001, a 328-foot (100 m)-wide sandbar formed at the mouth of the river, marking the first time in recorded history that the Rio Grande failed to empty into the Gulf of Mexico. The sandbar was dredged, but reformed almost immediately. Spring rains the following year flushed the reformed sandbar out to sea, but it returned in mid-2002. By late 2003, the river once again reached the Gulf. The United States and Mexico share the water of the river under a series of agreements administered by the International Boundary and Water Commission (IBWC), US-Mexico. The most notable of these treaties were signed in 1906 and 1944. The IBWC traces its institutional roots to 1889, when the International Boundary Committee was established to maintain the border. The IBWC today also allocates river waters between the two nations, and provides for flood control and water sanitation. Dams on the Rio Grande include Rio Grande Dam, Cochiti Dam, Elephant Butte Dam, Caballo Dam, Amistad Dam, Falcon Dam, Anzalduas Dam, and Retamal Dam. In southern New Mexico and the upper portion of the Texas border segment, the river's discharge dwindles. Diversions, mainly for agricultural irrigation, have increased the natural decrease in flow such that by the time the river reaches Presidio, little or no water is left. Below Presidio, the Rio Conchos restores the flow of water. Near Presidio, the river's discharge is frequently zero. Its average discharge is 178 cubic feet per second (5 m3/s), down from 945 cubic feet per second (27 m3/s) at Elephant Butte Dam. Supplemented by other tributaries, the Rio Grande's discharge increases to its maximum annual average of 3,504 cubic feet per second (99 m3/s) near Rio Grande City. Large diversions for irrigation below Rio Grande City reduce the river's average flow to 889 cubic feet per second (25 m3/s) at Brownsville and Matamoros. The major international border crossings along the river are at Ciudad Juárez and El Paso; Presidio and Ojinaga; Laredo and Nuevo Laredo; McAllen and Reynosa; and Brownsville and Matamoros. Other notable border towns are the Texas/Coahuila pairings of Del Rio–Ciudad Acuña and Eagle Pass–Piedras Negras. ^ a b c d e f Metz, Leon C. "Rio Grande". The Handbook of Texas Online. Retrieved July 17, 2010. ^ a b c d e f g h i j k l m n o p "Water Bulletin Number 75: Flow of the Rio Grande and Related Data; From Elephant Butte Dam, New Mexico to the Gulf of Mexico". International Boundary and Water Commission. 2005. Retrieved July 17, 2010. ^ a b "Rio Grande NASQAN Program". United States Geological Survey. Archived from the original on July 4, 2011. Retrieved July 17, 2010. ^ Benke, Arthur C.; Colbert E. Cushing (2005). Rivers of North America. Academic Press. pp. 186–192. ISBN 978-0-12-088253-3. ^ "Rio Grande River". Encyclopædia Britannica. Retrieved May 18, 2016. In some places the depth of the river has varied from nearly 60 feet (18 metres) to a bare trickle or nothing. ^ Tom Lea (1957) The King Ranch writes that Richard King made his fortune as a riverman on the Rio Grande before he proposed marriage to Henrietta and started his cattle ranch. ^ "The UGRR on the Rio Grande"
^ "Bibliography on Water Resources and International Law: Rio Grande". Peace Palace Library. Retrieved December 23, 2010. ^ For the spelling of Navajo terms: Young, Robert W & William Morgan, Sr. The Navajo Language. A Grammar and Colloquial Dictionary. University of New Mexico Press. Albuquerque, NM: 1987. ^ "Devils River Protection Campaign, Devils River Conservation Easements". The Nature Conservancy. Retrieved July 22, 2010. ^ "The Rio Conchos: An Essential Ribbon of Life". Environmental Defense Fund. Archived from the original on July 24, 2010. Retrieved July 20, 2010. ^ a b "Water resources data for the United States, Water Year 2009; gage 08353000 Rio Puerco near Barnardo, NM" (PDF). USGS. Retrieved July 21, 2010. ^ a b "Water resources data for the United States, Water Year 2009; gage 08329000, Jemez River below Jemez Canyon Dam, NM" (PDF). USGS. Retrieved July 20, 2010. ^ a b "Water resources data for the United States, Water Year 2009; gage 08317200 Santa Fe River above Cochiti Lake, NM" (PDF). USGS. Retrieved July 21, 2010. ^ a b "Water resources data for the United States, Water Year 2009; gage 08290000, Rio Chama near Chamita, NM" (PDF). USGS. Retrieved July 21, 2010. ^ a b "Water resources data for the United States, Water Year 2009; gage 08249000, Conejos River near Lasauses, CO" (PDF). USGS. Retrieved July 21, 2010.